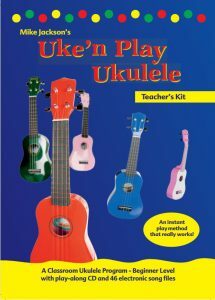 Based on the “Uke ‘n Play Ukulele” series, this is a beginner level collection put together by Mike Jackson, specifically for classroom use. Basic instruction has been adapted to the classroom situation and vital set-up information for the teacher is included. 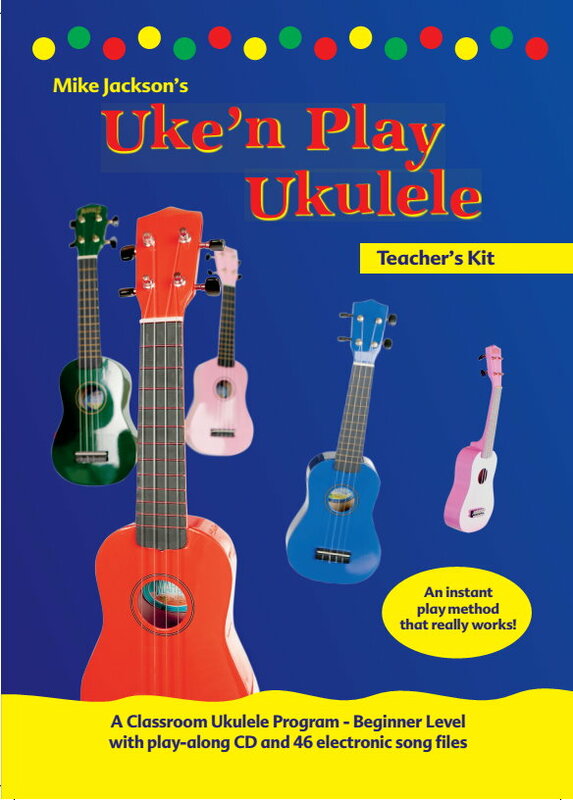 The book/CD package is designed to make the program workable for a classroom teacher as well as a music specialist. The songs range from very simple to easy, making the book/CD useable as a complete year’s program for a beginner class if desired. The songs give plenty of practice on the same one, two or three chords to help students gain confidence quickly. Your class will be performing at assemblies in no time! Pages can be photocopied and electronic files of the song lyrics and chords are included. These can be used for an electronic slide show and for printing song-sheets for student workbooks. The CD has recordings of all the songs – with lead vocals, ukulele and full band accompaniment. Playing-along helps keep the beat and song pace, as technique is being refined.